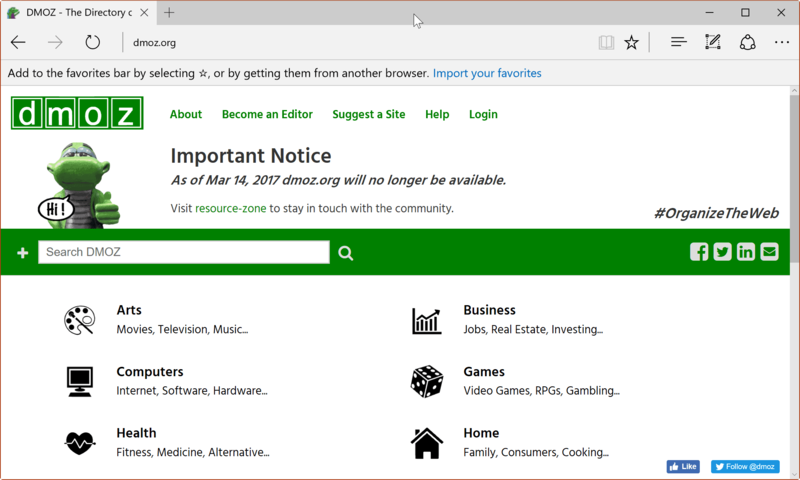 Dmoz, one of the longest standing, human curated, directories on the Internet will be shut down for good on March 14, 2017. Directories played a huge part in the early days of the Internet, especially if they were curated by companies or volunteers. There were several reasons for that. First, because search engines were not all that good in the days. Dmoz dates back to a time were Google did not exist yet, and Netscape fought it out against the dominating Internet Explorer browser. Yes, Opera was there to. It was a lot easier to use directories to find websites of interest, than to use a search engine. Second, webmasters used directories as a way to promote their sites. While there was a lot of abuse, especially when it came to automated directories that accepted any site, getting listed in a curated directory such as Dmoz or the Yahoo Directory. Links on those directories not only guaranteed a steady flow of visitors, but also a strong backlink which added weight to the site in search engines. The announcement does not highlight why Dmoz is shutting down, only that it is the case. Dmoz is owned by AOL, and the decision to shut down the site must have certainly come from AOL. While it is unclear why, costs of running and maintaining the site may have played a role next to Dmoz losing more and more relevancy on the Internet as a resource. The site will be taken down on March 14, 2017 and there is no indication that the directory will live on elsewhere. While you may be able to access its content on the Wayback Machine website, that only remains an option if AOL does not add a no robots tag to the site's index after shutting down Dmoz. The Dmoz directory outlived Yahoo's Directory for almost three years. While there are still plenty of directories around, none that I know of that has the name or popularity of Dmoz or Yahoo Directory. It is interesting to note that Dmoz won't vanish completely overnight. The NOODP meta tag is used by Internet sites to indicate to search engines that search engines should not use the descriptions by Dmoz if available, but the site's own. These tags won't do anything anymore after March 14, 2017, and it is recommended to remove them from sites after that date because of that. Update: Dmoz shut down on March 17, 2017. You can access a copy of the site on Dmoztools. Now You: Do you use directories on today's Internet? Thanks for the heads up I downloaded the RDF’s so I have all the links as of today and I’ll probably try to get the last one before the shutdown of the site. Very bizarre that AOL (a subsidiary of Verizon Communications) is closing this down. The site is predominately text-based, which means that it requires very low bandwidth and is inexpensive to maintain. There are over 90,000 volunteer editors that curate the content without compensation. The lack of any explanation of the shutdown is odd. At the least, you would think AOL/Verizon would offer the site to a private foundation, such as the Wikimedia Foundation. Bingo! Verizon Wireless benefits Hugely by brainless consumption of high bandwidth sites. It is very hard to find sites with low bandwidth consuming designs, and hipster web designers hate old but useful tech. But I think for the users of the internet it is sad to see this happen. There should be more directories in fact. Let us go back to basics, when you are browsing in a shop, you don’t know what you want, but hope to see something you like. It is the same on the Internet, Search engines are well and good if you know where you are heading and know what you want, for me if I saw a list of potential subjects and saw one which made me curious to have a look, I would click to look. I would bet that this is due to changes in googles algo, mainly panda. They may realized that their rank was slipping and bringing down the majority of the internet as well, as 99% of public sites are listed there. Just my two cents. BTW. I have disavowed backlinks from DMOZ to the sites I manage as precaution. Functional since 18th of august 2018. Almost totally forget about them.